MULTI-AWARD winning artist Tom Curtain is bringing a piece of the Territory to the east for four months from December. 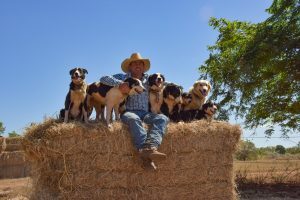 Accompanied by his horses, dogs and original music, the singer-songwriter is taking Katherine Outback Experience on the road to many rural and remote communities that don’t often get these sorts of events. “Many of these communities are in drought and need something to look forward to, to make them smile and allow them to forget about their worries for a couple of hours,” Tom said. Tom is a horse and dog trainer and an all-round entertainer and loves to make audiences smile with his family-friendly performances. “Combining the horses, dogs and music provides a real family-orientated event,” he said. It’s not all about fun and games, though; the Katherine Golden Guitar winner has a serious message to spread as part of his Speak Up Tour through school visits. Through his close relationship with the parents of Amy ‘Dolly’ Everett, Tom was inspired to write ‘Speak Up’, following the teenager’s sudden death after being relentlessly bullied. He released the single with fellow Golden Guitar winner, Sara Storer, raising money and awareness for Dolly’s Dream. The hit song reached No. 1 on the iTunes Country Music Chart. Tom will tour schools and communities as part of his national Speak Up Tour in late 2018/ early 2019 to promote the positive message behind the song and encourage people to speak up against bullying so no other family has to endure the tragedy the Everett family has faced. Through his work in raising awareness of the effects of bullying, Tom became involved in Dolly’s Dream. The organisation works to raise awareness of bullying and its effects, prevent bullying and to support victims of bullying. “We have had an amazing response from schools already wanting to be involved,” Tom said. Each show on the tour will include a one-hour outback horse and dog show, followed by an hour of live music from Tom. Tom and the team will travel 13,500km over three-and-a-half months starting in Queensland, through New South Wales, finishing in Victoria in early March. The show will feature at the Tamworth Country Music Festival from Monday, January 21 to Friday, January 25 at the former indoor rodeo arena. As Tom travels through each region, he will be inviting up-and-coming country artists to open the shows. Tom and his working dogs and horses are available for public appearances, so they encourage schools, local markets and other groups to get in contact to make a booking.